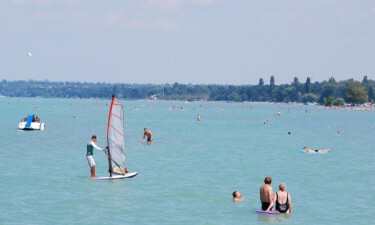 Camping Village Aranypart is located in Hungary by the Lake Balaton. It is a great campsite for the family with smaller kids, due to their different activites. 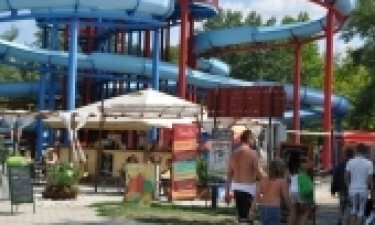 Camping Village Aranypart is situated at the southern coast of the lake Balaton in Hungary. The campsite has a view beyond the usual, due to the location. Only 5 km from the campsite, the city, Siófok is located. Here you have the option to go on the ferry to Tihany, which is a famous island. Just 100 km from Village Aranypart you will find the capital of Hungary, called Budapest. Why should you choose Village Aranypart as your next destination? We have listed 4 reasons why, below. The beach is placed just by the lake and consits of a large lawn with trees. Here you will find a beachbar and different watersports such as windsurfing or water skiing. The pool area at the campsite has a big waterslide and is obviously a very popular place for the kids of the family. With a surcharge you could play tennis or minigolf, rent a bike or go fishing. In the high season, the campsites restaurant is open for guests. In addition you could also use the pizzaria and the ice cream shop. With a little walk of 200 meters from the campsite, you will find a supermarked. If this is not enough, Siófok offers many different kinds of shops for you to visit.